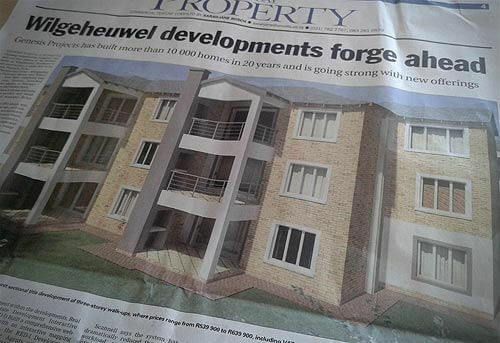 Genesis Projects, the 20 year old Gauteng based construction company, has four phases of their Wilgeheuwel, Roodepoort, developments already sold out and construction is under way at the latest, Pinnacle Park. The previous three, which are all completed and handed over, are Whispering Pines, Galloway Manor and Wilson Manor. Genesis Projects are not slowing down, however, and launched in February another two phases, Forest Acres and Saddle Rock. Demand here is strong and sales are coming in quickly and steadily, says Brian Scannell, Genesis Projects’ project manager. Forest Acres, the fifth phase, was launched three weeks ago, and this project offers 52 freehold, double storey plot and plan units. The homes here have three bedrooms and two-and-a-half bathrooms, with private gardens and double lockup garages. The sizes vary from 125m² to 142m² and the units are priced from R819 900 to R849 900, with all transaction costs included. There are three variations from which to choose, with or without balconies off the main bedrooms, says Scannell. All the units are fully walled and have private gardens. In addition to this, Forest Acres will be ideal for families with animals, as this will be a pet friendly complex, he said. Construction at Forest Acres is expected to begin around June this year and Genesis Projects expect to hand over units by December 2014. At Genesis Projects’ sixth project, Saddle Rock, they are offering 51 sectional title units in three storey walk-ups. The units at Saddle Rock range from two bedroom one bathroom units to three bedroom two bathroom apartments. All units have covered parking bays (two bedroom units have one covered parking bay each and three bedroom units have double bays). All units will also have a covered patio or balcony with a built in braai. The prices range from R539 900 to R639 900, including VAT, transfer costs and attorneys’ fees. Sales at both Forest Acres and Saddle Rock are going very well, said Scannell, with 39 and 19 units signed for respectively, and they expect to release the next four phases over the next five months. To assist with sales and management of these within the developments, Genesis Projects’ have had a comprehensive website built by Real Estate Development Interactive (RED-I) that has an interactive mapping system, the RED-I Development Explorer, and are using the RED-I SIMS (Sales Information Management System). On their website, www.genesisprojects.com, prospective buyers can find a full map layout of the projects being sold, and the system will inform buyers of which units are available within the development. On the map, units marked with red dots are signed for and the ones marked with green dots are available. Buyers can then click on the relevant dot to view the price of the unit and the 3D floor plan. Genesis Projects has built over 10 000 homes in their 20 years of operation and they have their own bond origination division as well as using their own legal team to handle all conveyancing and bond registrations.